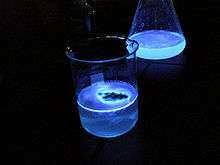 For other uses, see Luminescence (disambiguation). Luminescence is emission of light by a substance not resulting from heat; it is thus a form of cold-body radiation. It can be caused by chemical reactions, electrical energy, subatomic motions, or stress on a crystal. This distinguishes luminescence from incandescence, which is light emitted by a substance as a result of heating. Historically, radioactivity was thought of as a form of "radio-luminescence", although it is today considered to be separate since it involves more than electromagnetic radiation. The term 'luminescence' was introduced in 1888 by Eilhard Wiedemann. The dials, hands, scales, and signs of aviation and navigational instruments and markings are often coated with luminescent materials in a process known as "luminising". Luminescence occurs in some minerals when they are exposed to low-powered sources of ultraviolet or infrared electromagnetic radiation (for example, portable UV lamps), at atmospheric pressure and atmospheric temperatures. This property of these minerals can be used during the process of mineral identification at rock outcrops in the field, or in the laboratory. ↑ Meetei, Sanoujam Dhiren. "Synthesis, Characterization and Photoluminescence of ZrO2:Eu3+ Nanocrystals" (PDF). Retrieved 18 December 2014. 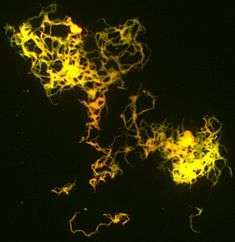 Wikimedia Commons has media related to Luminescence.